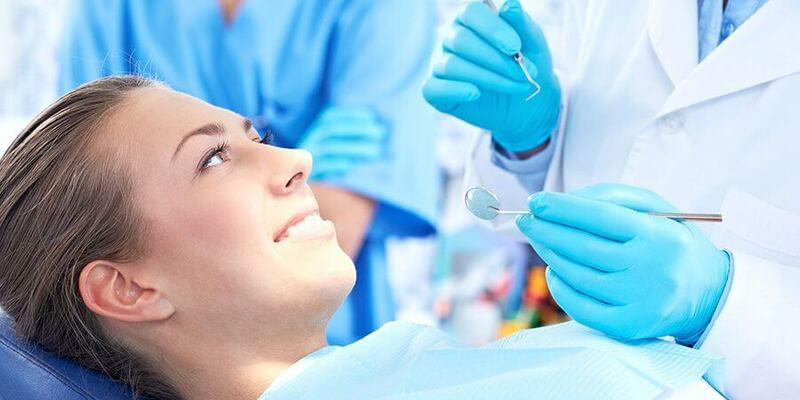 An apicectomy is a surgical procedure in which a portion of the root of a tooth is removed. An apicectomy should not be considered an elective procedure, but should be undertaken only when conventional endodontic root filling techniques have failed. A conventional endodontic treatment (root canal therapy) is indicated if the dental pulp (nerve) of a tooth becomes non-vital (dies) or is likely to be put at risk due to the type or size of restoration needed to repair the tooth. During endodontic treatment the dental surgeon will remove the non-vital dental pulp from the tooth and replace it with an inert filling material which is visible on x-ray. Most teeth will respond satisfactorily to this type of treatment and be symptom free. Some however will require an apicectomy. Why is an Apicectomy indicated? overextended root fillings – occasionally the root filling material used in conventional endodontic treatment may extend through the end of the root of the tooth. This material will cause a reaction akin to an infection around the end of the root of the tooth. underfilling of the root canal – if this occurs, part of the non-vital dental pulp will remain and cause an infection around the end of the root of the tooth. fracture of an endodontic instrument – the instruments used during endodontic treatment are extremely fine and brittle, and occasionally they may fracture in the canal of the tooth. They should be retrieved during an apicectomy. where the end of the tooth curves sharply – in this situation the dental surgeon may not be able to get the instrument past this curvature and hence non-vital dental pulp will be left in the tooth and cause an infection. This part of the root will be removed in an apicectomy. repeated infection around the end of the root despite adequate endodontic treatment – when an infection has been long standing before conventional endodontic treatment is undertaken it may become self-perpetuating despite a root canal treatment. The area of infection is removed during an apicectomy. the root canal is obliterated – in older patients the root canals of teeth may become blocked by dentine and prevent the completion of conventional endodontic treatment. the presence of accessory root canals – some teeth have extremely small (usually not visible on x-ray) extra root canals towards the ends of their roots and this can not be instrumented in a conventional root canal treatment. An apicectomy will remove the part of the root in which these extra canals exist and hence remove the non-vital dental pulp contained therein. the repair of root perforations – perforations in the sides of the roots of teeth may arise from internal or external resorption or from instruments or metal posts placed in the canals of teeth. It is most difficult to repair these defects, even surgically, and a repair procedure may only be a temporary measure. How is an Apicectomy carried out? The procedure may be carried out using either a local anaesthetic, with or without intravenous sedation, or a general anaesthetic in a hospital operating theatre. The choice between the methods will depend upon the degree of difficulty of the procedure, your medical history, and your own personal choice. Most, however, are carried out using local anaesthetic with intravenous sedation. During the procedure a small “window” is made (with a scalpel) in the gum over the root of the tooth. Using a dental drill, the area around the end of the root of the tooth is exposed to determine the amount of tooth root that should be removed. This portion of tooth root is then removed with the drill. 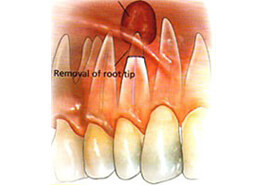 Any infected tissue is removed from around the end of the root of the tooth. At this stage a decision is made to place a medicated filling material into the canal of the tooth – the decision to do so depends upon the seal of the root canal filling material. The gum is then placed into its original position and several stitches (usually dissolving) are placed to speed the healing process. What happens after an Apicectomy? pain – the discomfort requires the prescription of a moderate strength analgesic such as Panadeine Forte. You will probably need to use them for about 48 hours after the procedure. swelling – the gum around the surgical area and quite often the face will swell for the first few days and this is quite normal following such a surgical procedure. bruising – a small bruise may also occur on the skin of the face over the surgical area. Healing within the bone and around the end of the root of the tooth should be expected to be complete within six months. This can easily be checked by your dental surgeon with an x-ray of the tooth. An apicectomy is usually carried out due to the tooth being in a debilitated state and it is possible for the procedure not to be successful. If this is so, the tooth will again cause symptoms such as pain, swelling and gum boils. If this occurs, it is possible to re-apicoectomise the tooth in an attempt to save it. Should the procedure fail again it may be necessary to extract the tooth. Your oral surgeon will usually be able to give you a prognosis for the tooth at the first consultation and or when the apicectomy is carried out. It is now possible to perform root canal treatments on almost all teeth hence an apicectomy is also surgically possible. Although the procedure becomes technically more difficult on the posterior teeth – the failure rate of conventional endodontic treatment and apicectomy increases on the posterior teeth. During conventional endodontic therapy the dental surgeon will take every care but occasionally the optimum results are not able to be achieved. If your dental surgeon recommends an apicectomy, it is because he feels that the tooth may be lost without it and that an apicectomy may be the only method of saving the tooth.